It’s time to take stock as the musicians of the OSM and their conductor make their way home after playing in Krakow, Poland, and opening the prestigious Salzburg Festival in Austria. On July 20, Kent Nagano and the OSM opened the 98th edition of the Salzburg Festival to a full house of 1400 spectators. It was the orchestra’s fifth visit to Austria, but nevertheless their first appearance at this grand international festival — making the OSM the first Canadian orchestra in history to appear at the Salzburg Festival. 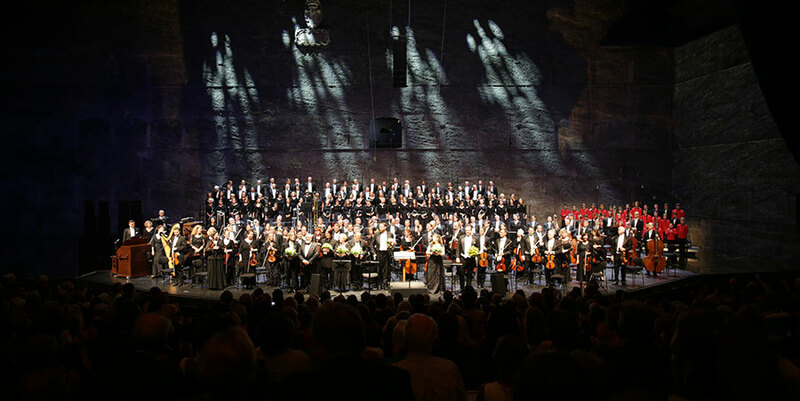 This inaugural concert was part of the Festival’s Ouverture spirituelle series, dedicated to sacred music, and took place at the Felsenreitschule, a mythical venue carved from the native rock, which lent itself marvelously to such a dramatic work. A recording of the performance was made and will be released in 2019 on the label BIS Records. Two days earlier, the OSM performed the piece before an audience of 1700, including the composer himself, at Krakow’s ICE Congress Centre. The concert was the subject of several articles and reviews in some important Austrian media outlets. The reviews were favourable towards the OSM’s interpretation of this monumental and rarely-performed work by Penderecki. Critics emphasized Kent Nagano’s musical vision and profoundly spiritual reading of the work. They also praised the excellence of the musicians and the soloists, Sarah Wegener (soprano), Lucas Meachem (baritone), and Matthew Rose (bass), as well as narrator Slawomir Holland. “Nagano chose not the ‘earthly’ path, direct and dramatically absorbing, but rather the ‘spiritual’ approach, indicating the path of the Great Beyond. The OSM will leave on tour again twice more in the next year. This autumn, from September 9 to 19, the orchestra will visit six communities in Nunavik and the Côte-Nord. A chamber opera entitled Chaakapesh: The Trickster’s Quest, a special commission from author Tomson Highway and composer Matthew Rickets for this tour, will have its world premier in Montréal during next season’s opening concert on September 6 and 8. In the spring, a large European tour will take place from March 11 to 23 in eight cities, including Dusseldorf, Hamburg, Essen, Vienna, Brussels, Munich, Ratisbonne, and Berlin. Guest soloists will include Marie-Nicole Lemieux and pianists Rafal Blechacz and Jean-Yves Thibaudet. March 5 and 6 with Jean-Yves Thibaudet (Saint-Saëns’ Piano Concerto no 5).